What is an analogue to digital audio converter? Welcome to this video on defining analogue to digital audio converters. An analogue to digital audio converter converts an incoming electrical pressure sound wave into a digital data stream. In essence, a changing pattern of electrical pressure voltage is converted into 1's and 0s. This is done in order that the audio signal may be recorded, stored, cloned, processed, edited, transmitted and replayed by a digital audio device or computer. 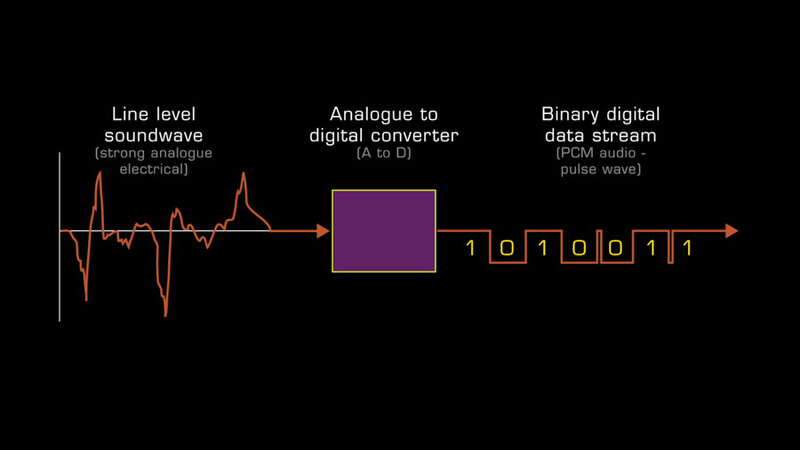 The process of analogue to digital conversion, or A to D conversion, is also referred to as Pulse Code Modulation, or PCM for short, and digital audio signals themselves by the generic term "PCM audio". As we have already learnt, in electrical form all digital signals take the form of a pulse wave. WAV and AIFF are the most commonly used uncompressed PCM file formats, and MP3, ACC, OGG, and FLAK are examples of compressed formats. Compressed and uncompressed file formats are covered in detail in other videos. A knowledge of the principal theories of conversion, including sample rate and word length, is important knowledge for studio owners who need to control the quality and file size of their digital audio recordings. The quality of A to D conversion is paramount if we are to record sound with as little distortion as possible. Quality depends on 2 primary factors. They are ..
Today, even cost effective audio interface converters are capable of impressive sound quality and the law of diminishing returns applies as you spend more. To put this in context, the layman may not be able to hear much, if any difference, between a budget converter and a hi-end device. On the other hand, conversion settings can have a dramatic impact on quality, and that is why it is important for us to understand them. Caption - Where can converters be found? The term "analogue to digital converter" is used to define 2 things ..
Firstly, a dedicated stand alone hardware device which will usually have connectors to both accept an incoming line level analogue electrical pressure sound wave, and output a digital audio data stream. Such a device will almost certainly have connectors to receive or send digital synchronisation signals such as word clock. The second use of the term is to describe a circuit board or chip set located inside a multi-function device such as an audio interface, sampler, video camcorder or mobile phone. 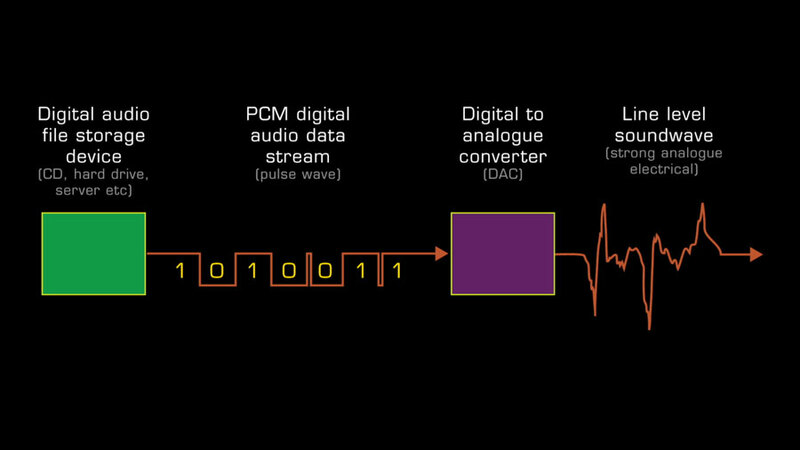 The process of re-creating an analogue audio signal from digital PCM data, in order that it may heard, is handled by a digital to analogue converter, or DAC for short. This involves a process know as "successive approximations" and is of interest to digital audio hardware designers but not essential knowledge for studio owners. It's probably fair to say that even most cost effective DACs are of a sufficiently high standard that their quality need not concern us unduly, and besides, few DACs have any settings for us to tinker with, and, we have little or no control over what quality of converter our audience is using. It's the analogue to digital conversion that we must pay most attention to.